I've changed the images to use Imgur instead of attachments. Not sure how I could make the images expandable though. Maybe you could make use of spoiler tags? Chess player, amateur writer and on the side shitposter extraordinaire. Let me know if you understand all the rules or if you have rule questions. I will add a little flag in the diagram to any piece that is holding a flag. I'll also try a spoiler tag, but I'm not sure if I will like it. Assuming I've read the rule correctly. 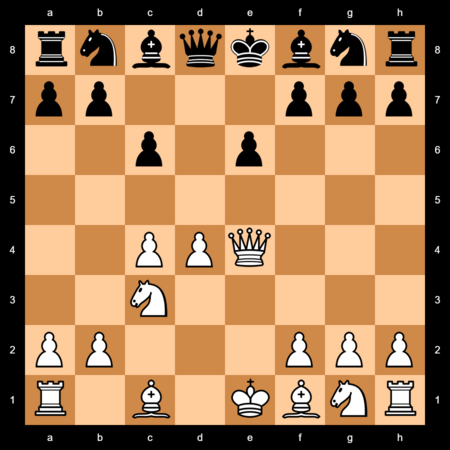 That is a legal move Qc2-Qxe4 would also have worked. Do you guys like this spoiler window or should I post the diagram directly? Apologies, things are going to be quite slow for me in the coming weeks. It's ok, no worries. I'll just keep checking and respond whenever. I live in New York City which is 5 hours behind prime meridian if that helps with timing at all. You live in NYC too?